When purchasing ten or more of the same coin, the coin will frequently come packaged in a tube, whether buying directly from the mint or from a reseller. 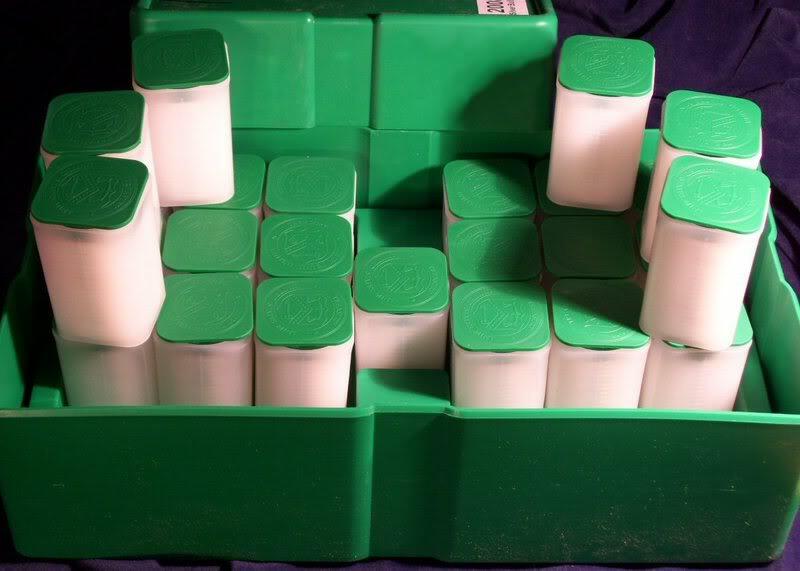 Tubes are plastic containers designed to hold a number of the same size coins. Silver bullion coins, as well as many other styles of coin, are frequently packaged by the mint in a plastic coin tube. Often referred to as “mint tubes,” they are designed to protect the coins during shipping. The tubes fit into a specially-designed box, known as a “monster box,” which may hold 500 or more coins. With one ounce bullion coins, each tube is generally designed to hold between 10 and 25 coins. Coins in other sizes may come in differently-sized tubes. For example, the U.S. Mint Silver American Eagle, a 1 ounce bullion coin, is shipped in square tubes which each hold 20 coins. Similarly the 1 ounce Austrian Silver Philharmonic also comes in tubes of 20. Meanwhile, the Canadian Gold Maple Leaf tube from the Royal Canadian Mint holds ten coins, while the Canadian Silver Leaf 1 ounce coin comes in a 25-coin tube. The American Gold Eagle comes in a sealed Treasury tube that either holds 20 one-ounce coins, 40 half-ounce coins, 40 quarter-ounce coins, or 50 tenth-ounce coins. Each of these tubes is specially designed to fit the exact quantity and size of coin specified. Such tubes are usually not interchangeable. For example, an American Silver Eagle coin tube will not perfectly fit a stack of Canadian Maple Leaf coins, even though both coins are 1 troy ounce of silver, due to differing diameters and coin thicknesses. Some bullion coins do not come packaged in tubes, but rather are individually packed. This is the case with the Australian Kangaroo, the Chinese Panda, and most sizes of the Canadian Maple Leaf other than the one-ounce coin. If you have purchased a quantity of silver bullion coins, it is best to keep your coins in their original holders, whatever form they may take. Original tubes produced by a government mint such as the Royal Canadian Mint or U.S. mint tend to be durable, opaque plastic sealed with a colored plastic lid stamped with the seal of the mint. If the tube does not have these features, it is likely a generic coin tube that has been used to repackage the coins. Some coin tubes are round to accommodate the exact size of the coin, while others are square in order to make them easier to stack. Owing to the convenience of storing these coin tubes, many collectors and investors purchase their bullion coins by the tube. These official coin tubes should not be confused with the empty plastic coin tubes which may be purchased to store any number of different coins. Either type of tube is a great way to keep rolls or large quantities of coins safe. Such tubes keep the coins from rubbing against each other, causing wear. They are also designed to take up less space than boxes, envelopes, albums, and other methods of coin storage.